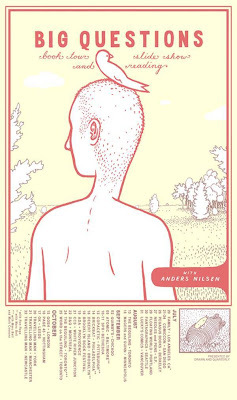 Tour poster for Anders Nilsen and his graphic novel Big Questions (Drawn & Quarterly). 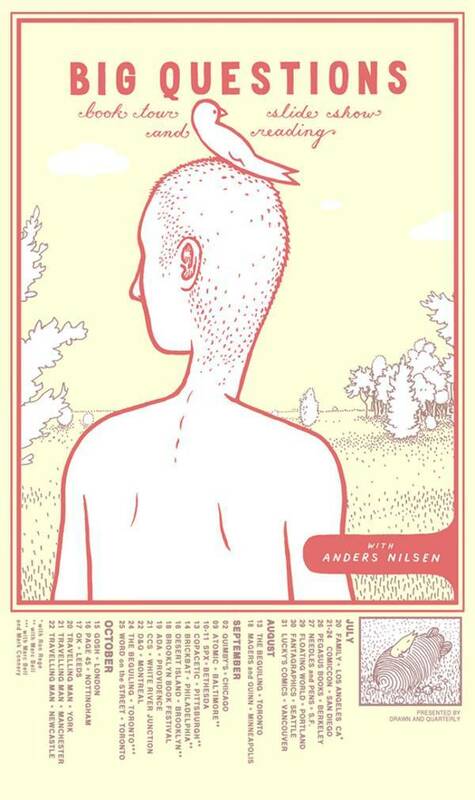 In July, Chicago-based cartoonist and illustrator Anders Nilsen embarked on a lengthy book tour, hitting four countries in three months. His 600-page magnum opus, Big Questions, is the culmination of ten years of his drawings, and much-anticipated by the fans of this celebrated artist. In September he stopped in Pittsburgh (with Marc Bell) for a standing-room-only event at Copacetic Comics and (its downstairs neighbor) Lili Coffee Shop. Copacetic is one of Pittsburgh's great bookstores for a number of reasons, not least because owner Bill Boichel is a tireless champion of indie comics. Today. Anders makes his 2011 small press recommendations, based on three months of browsing many of the world's best comic bookstores. 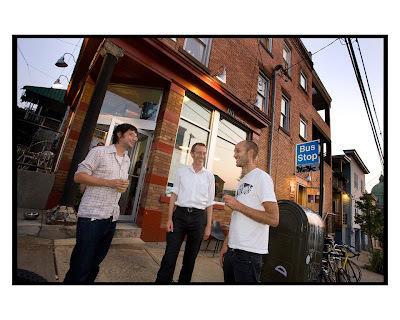 Marc Bell, Bill Boichel, and Anders Nilsen outside of Lili Coffee Shop and Copacetic Comics. September 13, 2011. Photo by Larry Rippel. Browsing at Copacetic Comics, Pittsburgh.